I bought this half-heartedly because I wasn’t sure if I’d like this combination or not. As it turned out I loved the mint flavour added to the drinking chocolate. It tastes so nice and I think it was ingenious to add the mint. Omg I love this hot chocolate so much. I used to buy a couple when they were on special because I drank it so often. Haven’t had one in a long time but I wouldn’t say no! I love this product its super tasty and the mint flavour seems to keep me more satisfied and stops me from overinduging. If you like mint and chocolate definitely give it a try. Cadbury mint flavoured drinking chocolate is a delicious hot drink on a cold day,the mint l love and it’s a nice change from the regular. I am a choc mint lover and this certainly satisfies the craving! It is also reasonably priced. I love the minty taste it combines that with just the right amount of chocolate. Made with warm milk it’s even better! Cadbury drinking chocolate in delicious mint flavour must have been created just for me! I adore all food and drink with mint and this drink is yummy! 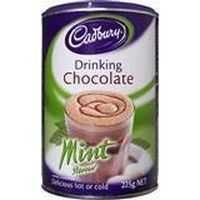 How would you rate Cadbury Drinking Chocolate Mint Flavour?